Pattern for child's dress and pattern for matching dress for 17 inch doll. Dress has pleated front gathered at raised waistline seam. Back zipper, tie ends, purchased lace collar, lace trim, ribbon bow, button trim. Long or short puffed sleeves gathered to bands. 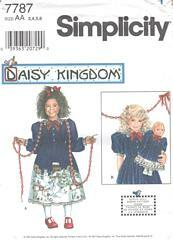 Matching doll dress pattern with long sleeves is included. Copyright 1997 and now out of print.